When Jaws came out in 1975, coastal towns everywhere, including San Diego, were gripped with a mania when it came to the water. People had a newfound fear of sharks thanks to the Stephen Spielberg thriller. Over time, as statistics showed shark phobia was (mostly) unfounded, the public flocked back to the water. But now, with water sports enjoying a resurgence in Southern California, there’s a new threat to swimmer safety that has nothing to do with sharks. You Sure About the Sharks? A person has a one in 63 chance of dying from the flu. Compare that with a one in 3,700,000 chance of being killed by a shark. Movies may make sharks out to be a terrifying threat, but in reality they are rarely seen, let alone caught attacking a human. To date, there have been 23 attacks in the United States for 2018. Considering the millions of people hitting the beaches, that’s not bad. The real danger to beachgoers and action sport junkies is the proliferation of water sports such as surfing and paddle-boarding. People who are poorly trained, or worse yet, who have faulty or poorly designed equipment, are suffering severe injuries in record numbers. Which Sports Are the Most Dangerous? San Diego is a surfing town. Surfers, from beginners to experts, flock here from all over the world to test themselves against our justifiably famous surf. 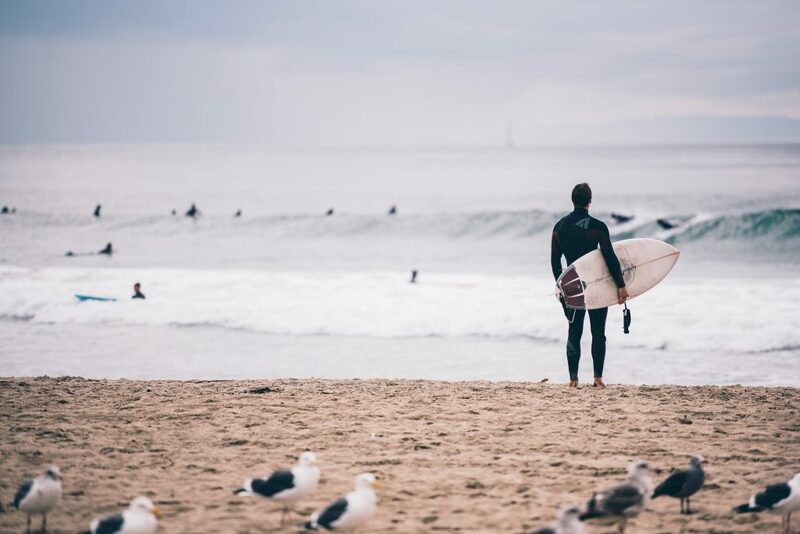 Beaches like Tourmaline, Mission, and Silver Strand attract not only surfers and water enthusiasts but outfitters, gear shops, instructors, and hotels, all catering to the San Diego surf culture. Everyone knows that surfing can be dangerous, but its ubiquity often leads vendors to act unscrupulously, whether it’s pushing beginners out beyond their comfort zone, or offering gear that has not been thoroughly vetted. A study in the American Journal of Emergency Medicine found that lacerations accounted for 42% of all acute surfing injuries surveyed, while contusions were the culprit 13% of the time, sprains or strains 12%, and fractures 8%. The lower extremities took 37% of serious injuries, while 37% were to the head and neck. In total, 67% of severe surfing injuries were caused by board contact, whether the person’s own board or another surfer’s. The study suggested that equipment modifications could decrease the risk of injury. While we expect some measure of danger will be involved with surfing, it may come as shock that “tamer” alternatives also carry serious risks. For example, boogie boarding, often pushed as a safer version of surfing, can be painful. A report in the Medical Journal of Australia postulated that boogie boarding places the rider at risk of suffering severe abdominal injuries. They looked at three adolescent boarders who needed months to fully recover from their accidents. Paddle-boarding has grown quickly in popularity over the past few years, and it too leads to a surprising number of accidents. An Orthopaedic Journal of Sports Medicine survey of 240 paddle-boarders recorded more than 160 injuries. Some of the injuries involved overuse, due to the repetitive nature of paddling, but others were due to collisions with the board or paddle. What Can Be Done to Protect Water Enthusiasts? Obviously, when you combine sports and nature, accidents will happen. The ocean is unpredictable, and powerful waves and hidden undertows can appear from nowhere. But there are safer ways to participate in these sports. Anytime someone is injured because of the negligence of someone else, that person deserves to be fully compensated. For example, when a product is poorly designed or defective, it can cause a world of hurt. Surfers are often done in by their own board, whether by impact or getting entangled. In fact, it turns out the leash is one of the biggest contributors to surfing injuries, usually because it does not release when it should. Another leading cause of injury is collision with another surfer or boarder. When beaches are crowded, everyone must proceed with caution and look out for each other. If another surfer is behaving in a reckless manner and collides with you as a result, you may have a case against him. In some instances, injuries are caused by defective safety equipment or mistakes made by lifeguards. If a lifeguard is neglecting his duties and does not respond in a timely manner, or if the life-saving equipment does not work properly, then people in need of rescue can suffer serious, life-altering injuries. While lifeguards can’t prevent all accidents, they are there to protect you and to respond in an emergency. Failure to do so may be considered negligence. If you have been injured while participating in water sports and you suspect that it was someone else’s fault, the best thing you can do is consult with an experienced San Diego personal injury attorney to discuss your options. Jurewitz Law Group has been helping San Diegans for well over a decade. Call today for a free case evaluation at (888) 233-5020.